It’s Wednesday. It’s your ordinary, middle of the week, kind of day. Chad left to go help his Dad at work early this morning. I took my time getting up and getting moving. The dog decided to laze around for hours. It’s your average Wednesday. As I got up this morning to start my day, nothing felt different or special. I sat on my computer catching up on a few tasks and making my way through some work with my first cup of coffee. I worked on cleaning up around the house a little, folding laundry, and slowly put myself together for the day. When I went back down to the kitchen and started making my coffee, I made it same exact way I always make my coffee. Half a pack of Truvia in the bottom my cup, a breakfast blend K cup, topped off with almond milk and a quick stir. Everything was the same. It was when I went to grab the almond milk out of the fridge that my heart skipped a beat. You see, Chad went to the grocery store yesterday. I was so grateful that he was willing to tackle that task yesterday. Trying to go to the grocery store myself would have meant either leaving way earlier than I wanted to or getting home far later than I wanted and would have meant skipping my work out for the day. Chad gave me the gift of time yesterday by offering to go to the store and tackling our rather large grocery list. I was so thankful when I came home yesterday to find that he had not only gone to the grocery store but also picked up everything on the list, grabbed things he knew we needed that weren’t on the list, planned for dinners for the week and picked up the necessary ingredients, put everything away, and was working on dinner. I could have cried I was so happy. By doing that he gave me the opportunity to relax and go for a run after which we had a great night eating a meal we had prepared together. This morning was back to being just another Wednesday until I reached for the almond milk. 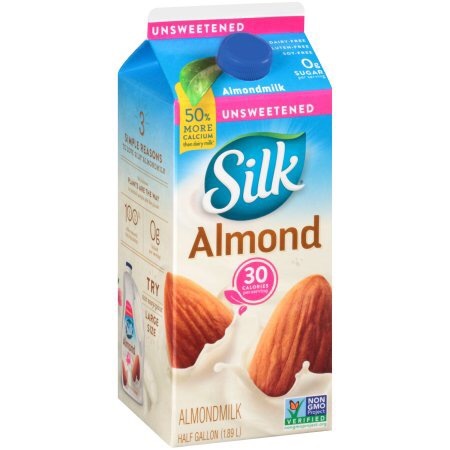 Behind it, I noticed one of the items Chad had picked up from the list was another half gallon of almond milk. I was elated when I saw it!! It wasn’t the fact that he had picked up something on the list itself, but the fact that it was the right kind. HE GOT THE RIGHT KIND OF ALMOND MILK!!! This might seem like an absurd thing to get so excited about, but do you know how many kinds of almond milk there are??? Sweetened, unsweetened, flavored, original, etc. The brand itself doesn’t matter to me, but I always go with the original unsweetened. Not only have I never asked him to pick up almond milk before, he also doesn’t use the almond milk himself. It’s usually all for me. What that means is that he has been listening to me and paying attention to those little details. It’s not the fact that he picked up almond milk or went to the grocery store, but the notion that he got the right kind and without needing to ask. That’s what made me fall in love with my best friend all over again. The almond milk was a strange little reminder that he is always looking out for me and my preferences and that he’s thinking about me. Grand gestures aren’t the ones that get me the most. It’s the little reminders that I am married to someone who loves me more than I could possibly imagine and who cares about the little stupid things like what kind of almond milk I prefer. The little things are the ones that matter. They are the moments that make life so wonderful and that fill me with joy every day. The little things are the ones I want to share more of. You may have noticed I’ve been away from the blog for a while and there’s been a lack of new content. Over the past several months, there have been some huge shifts in my personal and business life that have left me unsure how to continue with this site and have left me little time to really work toward any ideas I’ve had. I’ve been a little lost as to where to go, but all while knowing that I didn’t want to let On A Good Note simply fade away. The almond milk moment this morning made me not only fall in love with my husband all over, but made me fall in love with the idea of sharing these moments with you. So, to sum it all up, this page is headed in a different direction and I’m so in love with the idea of sharing new things with you. I’d love to hear about some of the little things and good notes that you cherish or that help you get through your day.